bl.uk > Online Gallery Home	> Online exhibitions	> Asia, Pacific and Africa Collections	> Chuttur Munzil, Lucknow. 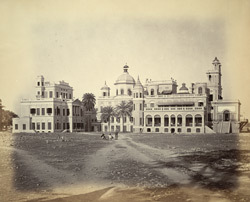 Photograph of the Chattar Manzil, Lucknow, from the ‘Album of Indian Views’, taken by Samuel Bourne c.1864. The Chattar Manzil or Umbrella Palaces were built along the banks of the River Gumti, around 1814-1837. The Chattar Manzil consisted of a Bari (larger) Chattar Manzil and Choti (smaller) Chattar Manzil, however only the larger one still exists. These two buildings were examples of the Indo-European Nawabi style, even though the Bari Chattar Manzil has been altered over the years. Along the top-floor of the building, the octagonal domes are crowned with a 'chatri' (umbrella), giving the building the title of Chattar Manzil. The Bara Chattar Manzil now houses the Central Drug Research Institute.